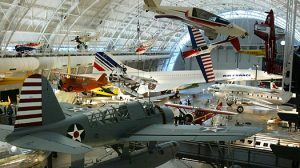 Event Description: An appealing site for a corporate team building event, the National Air and Space Museum is truly amazing. Okay, admit it. You’re a flight junkie. But even if you’re not, the Smithsonian has it all: The Wright Brother’s Plane; the Apollo moon lander; World War II fighters … you name it, if it’s aeronautic, it’s here. And you’ll see a big chunk of it all during your Dr. Clue treasure hunt, all around the museum. Not just for kids, the Air and Space museum is also an IDEAL INDOOR HUNT LOCATION for inclement weather, whether it’s cold and wet or hot and sweaty. During your corporate team building treasure hunt…expect a riveting day of exploration and team building as you journey through the history of flight. Admission not included in program fee.